This weekend had been over eight months in planning since we found out that we would be running the AGT, Porsche Carrera Cup and GT3 Cup Challenge on the same weekend! When we arrived at Phillip Island we had tested and prepared six cars, nine drivers and thirty crew, and we were ready for a big weekend! Brett 'Blisters' Boulton was looking forward to his second national level race weekend with his mate and team-mate Anthony Gilbertson. 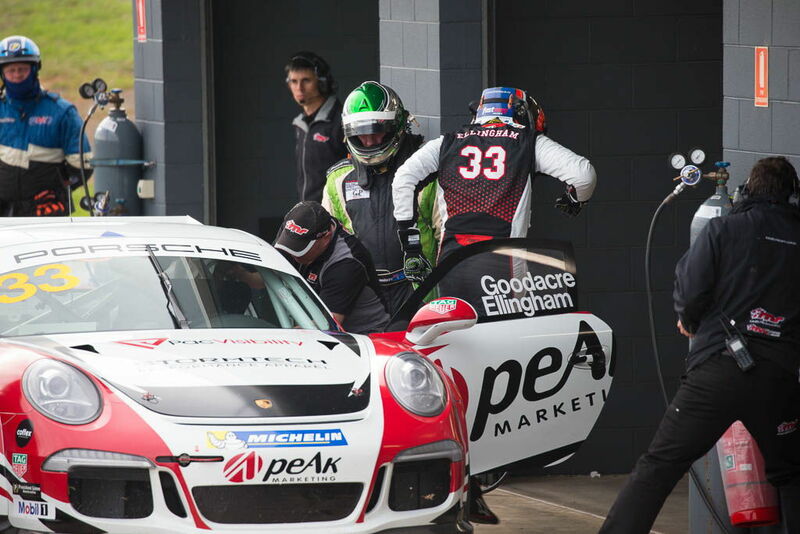 For the Carrera Cup Pro-Am race, we were welcoming former GT3 Cup Challenge Champion John Goodacre to MR to share with Simon Ellingham in the Peak Marketing Porsche. 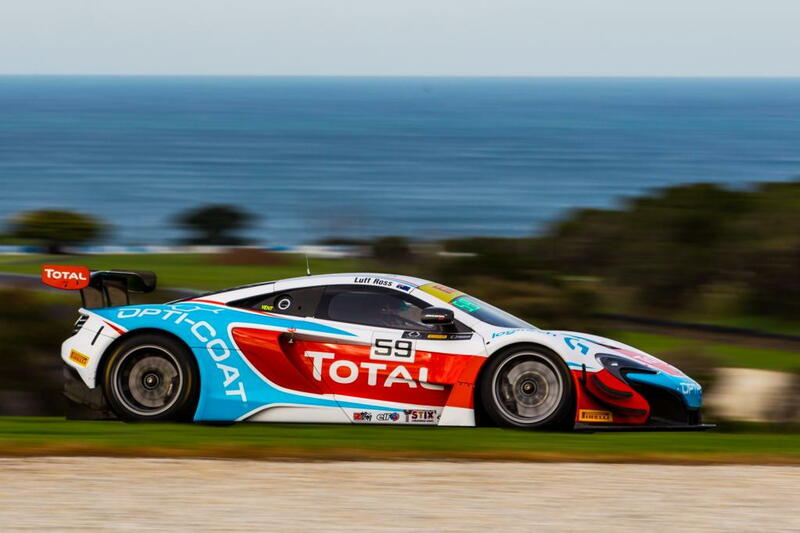 Tim was joining Jaxon in Car 7 and Anthony was having his first Carrera Cup start co-driving with James Abela while MR Supercoach Luffy was joining Fraser Ross in the first round of the 2017 Australian Endurance Championship in the mighty #59 McLaren. After qualifying, Jaxon and Tim had a combined time putting them on grid 11 for the first 1-hour Pro-Am race. Tim wasn't happy with his green tyre pace, but was determined to make amends in the races. Jaxon had a great dice with James for the first seven laps of race 1 until he managed to sneak by at turn 1. He handed the car over to Tim at the 33 minute mark and despite a quick spin at Lukey Heights on his second lap, Tim did a solid job engaging in another battle between car 7 and 54, this time car 54 was driven by Anthony. They finished 8th outright (and 6th in Pro class). In the tricky and damp conditions of race 2, Tim started on slicks and decided to tough it out rather than lose time pitting for wets on a drying track. An exciting moment exiting the daunting turn 12 in quite treacherous conditions resulted in contact with Anthony in car 54, but he was able to continue with slight damage. Undeterred, Tim did a striling job and handed the car over to Jaxon in almost one piece! Jaxon did a terrific job punching out some fastest laps to bring the car home 6th outright. The joint race results gave Tim and Jaxon a podium finish 3rd and in Pro Class. This was Tim's second Pro-Am podium. The combined driver qualifying times put Simon and John 12th for the start of race 1 just behind team mates Jaxon and Tim. Like his pro team-mates Simon started the race and settled into a nice rhythm with consistent times to hand the car over to John at the 30 minute mark. We changed the right side tyres at the pit stop, but unfortunately John thought the cold tyres coming up to temperature (with some 'pick up' sticking to the tyres surface) was in fact a puncture, so we pitted him to double check. They finished 13th outright and 7th in Pro class. In race 2 John started on slicks. We banked on the track drying quicker than it did so pitted him after 6 laps to change to wets. John handed over to Simon after 33 minutes and he kept out of trouble in very challenging conditions to finish 11th outright. James and Anthony qualified 9th being the fastest of the MR combinations. The crew had a bit of extra work to do after Anthony had a 'minor off' at the notorious Hay Shed corner in practice. James started race 1 and had a healthy dice with Jaxon for the first part of the race. He handed over to MR team-mate Anthony who also did a great job in his stint to catch and pass a few cars, including a torrid battle with Tim in car 7 to end up 7th outright and 5th in Pro class by the finish. Anthony started the second race but had to pit for wets then a few laps later was collected by Tim exiting turn 12 in a really unfortunate tangle, which put them out. It was a tough break for Gilbo who had endured a rough weekend, and it wasn't the result we wanted to mark the end of our relationship with James and his family. We wish him the best of luck in future. Brett did a great job to qualify 11th outright and 9th in Elite. He got a fair bit of wheel spin off the start dropping a spot, but kept out of trouble and came out on top after a good race with Ross McGregor, taking advantage of the mistakes of some others to finish an impressive 7th outright and 5th in Elite class. In the very tricky conditions of race 2, Brett got a cracker start making a few spots then drove the race of life to carve his way through the field to 2nd place outright. 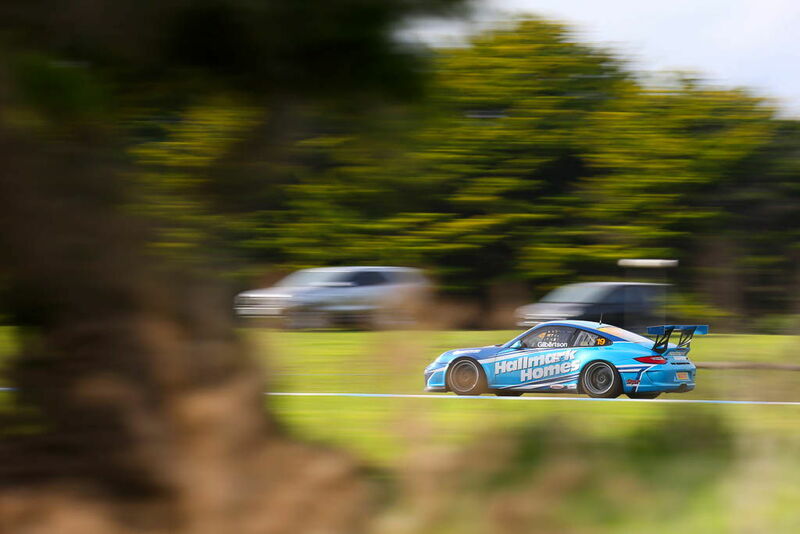 He lost second outright to recovering pro Jordan Love but still took his first GT3CC race win in Elite class. 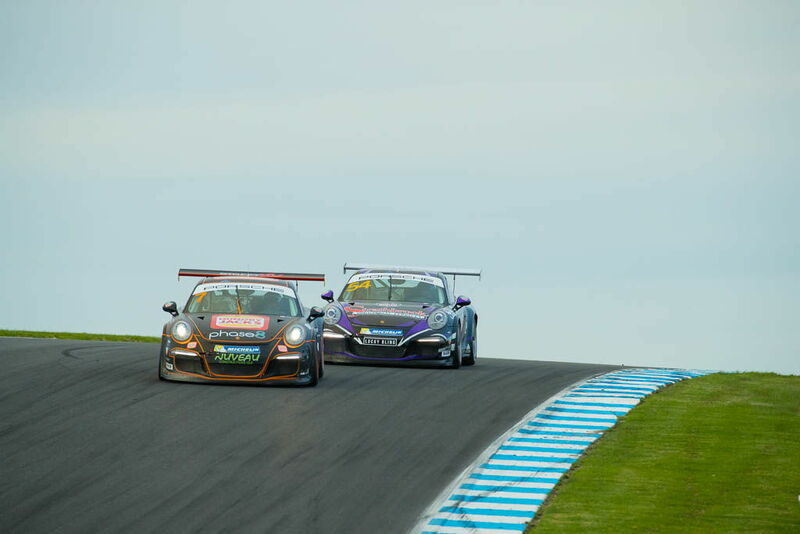 In race 3 Brett was involved in an epic battle for the lead of the Elite category. He drove brilliantly and was unlucky to be tagged in the rear wheel on the last lap causing a puncture and a very slow final lap. Despite the puncture 'Blisters' earned his first and well deserved podium finish in GT3CC. 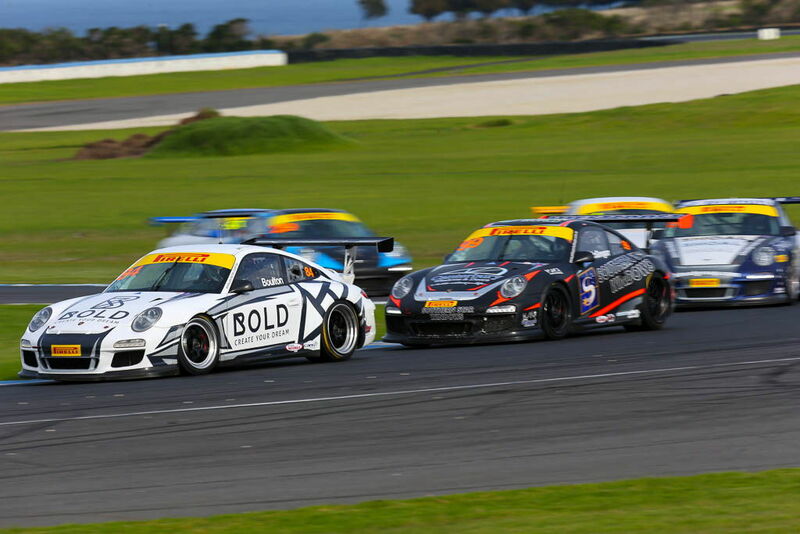 Anthony did another great job in qualifying to put the Hallmark Homes Porsche 3rd outright and 1st in Elite class. At the start of race 1 he pulled clear of his Elite competitors until a safety car bunched the field. 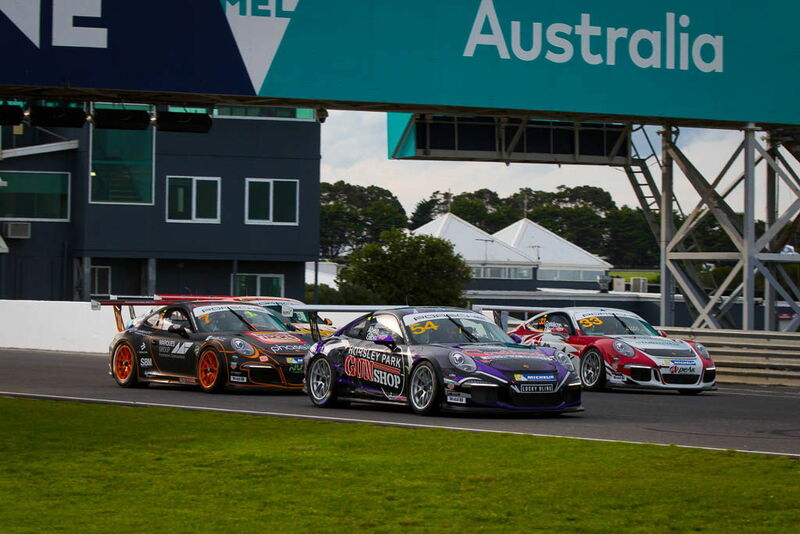 After the restart he had great pace to again pull clear of his competitors including championship protagonist Sam Shahin and finish only half a second behind young pro driver Brenton Grove. Race 2 started on a damp and greasy circuit. Anthony got a good start, was sitting a comfortable 2nd behind Grove and lost the rear of the car exiting turn 4. 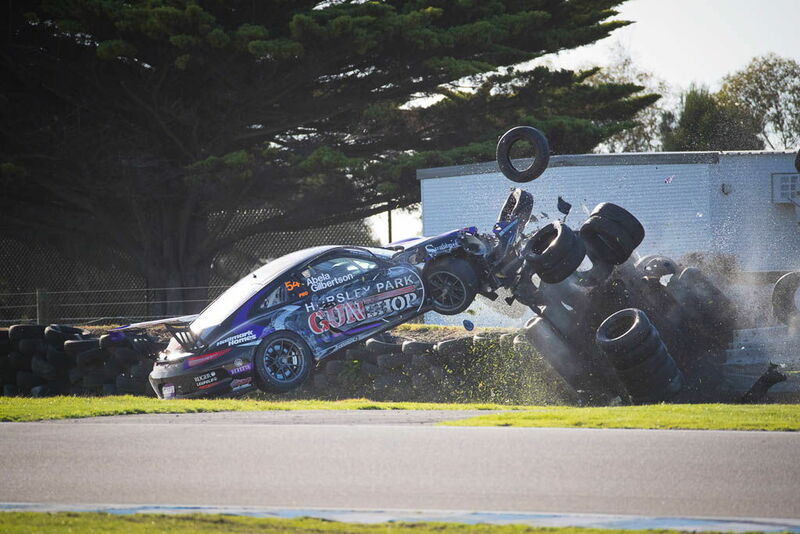 He continued but had another 'off' exiting Lukey heights where he broke the radiators and forced a DNF. 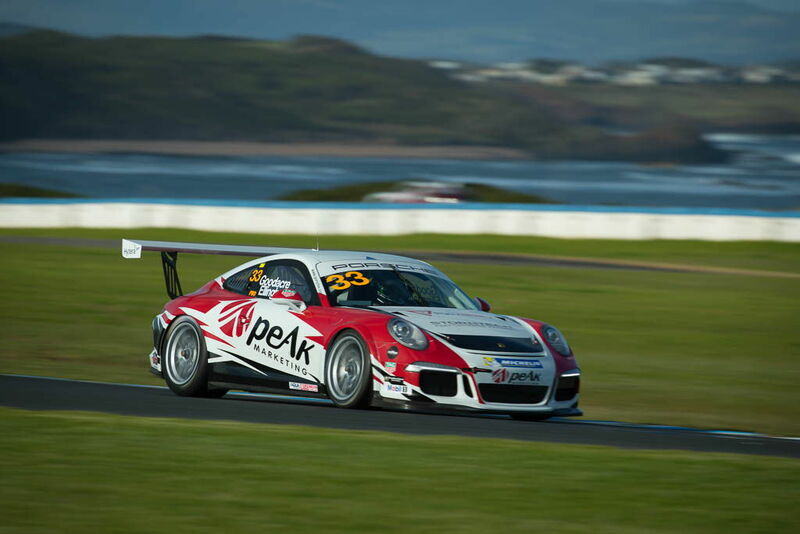 In race 3 'Gilbo' started off the rear of the grid and was making good progress through the field until a miscommunication with a slower car resulted in contact and a damaged radiator ending a tough weekend for Anthony at Phillip Island. Fraser and Luffy had a challenging start to the weekend with intake charge temperature issues instructing the ECU to knock power out of the engine. This was a tricky issue to and repair and obviously cost car 59 a lot of straight line speed in practise and qualifying. With the devastating lack of power, Fraser and Luffy both did an excellent job behind the wheel but only managed to qualify 15th. The MR AGT team did an absolutely outstanding job late into Saturday night to diagnose and rectify the issue which was caused by some non-standard McLaren GT parts in the cooling system. To everyone's relief car 59 was back to it's best in the Sunday morning warmup with Fraser posting the 6th fastest time. The first 3 hour race of the 2017 Australian Endurance Championship started in dry conditions, but Phillip Island was hit by a storm around 35 minutes into the race. 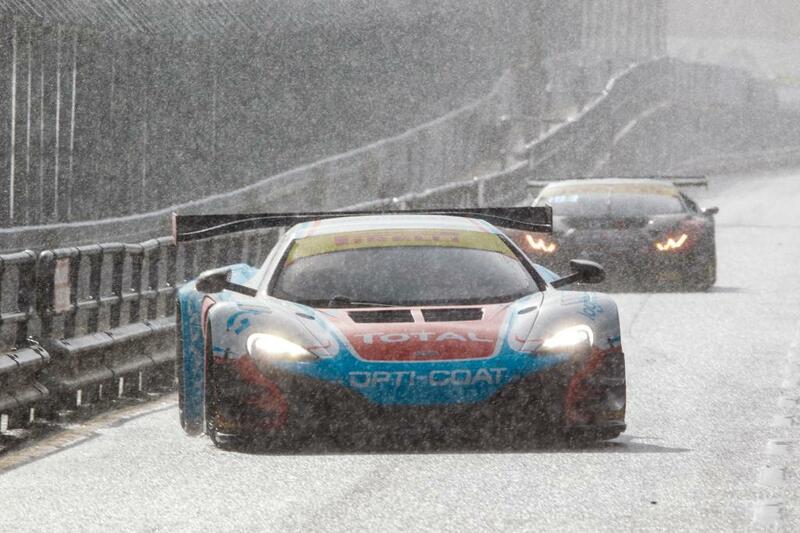 We switched to wets and Fraser did an outstand job to pass over 10 cars during his double stint getting to the critical lap number before Luffy climbed aboard the McLaren. Luffy did his usual professional job and crucially caught and passed for fourth place and got onto the lead lap just prior to a late safety car intervention. Once the race restarted, he caught and passed an AMG Mercedes for 3rd place and held that spot until the end of the race. 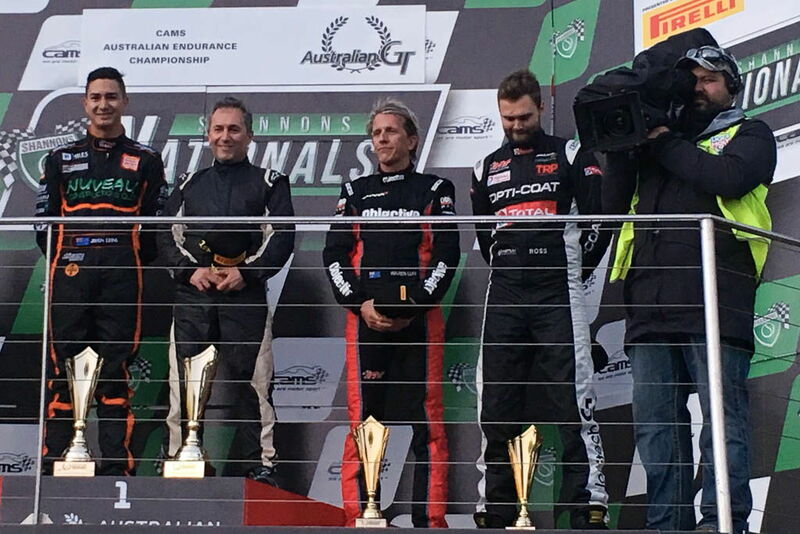 It was a terrific result for the MR team to rectify a pre-existing but very elusive fault with the car and give car owner Alex Franes, plus Fraser's sponsors Total, Opti-Coat and Logitech a podium finish and third place in the Australian Endurance Championship after the opening round. 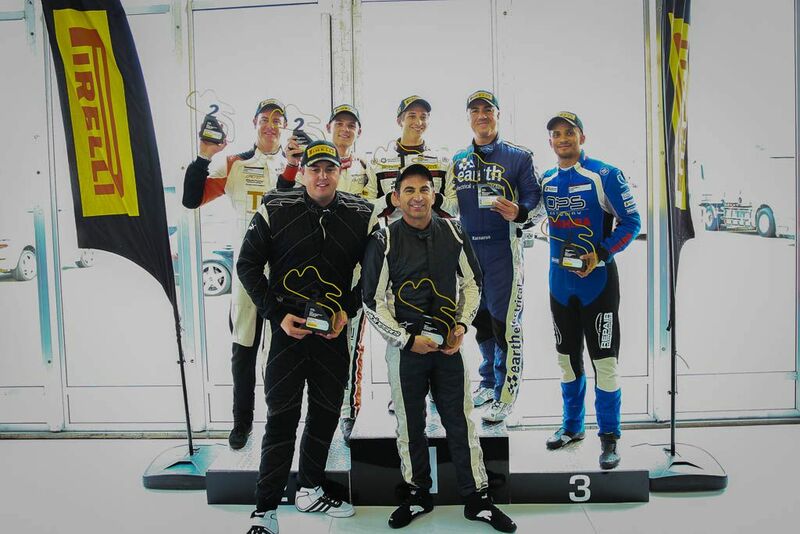 While there were a couple of low points over the weekend, we will remember the weekend for the absolute highlights like Anthony's win in GT3CC race 1, Brett's first GT3CC podium, Jaxon and Tim's 3rd place on the podium in the Carrera cup Pro-Am and of course Fraser and Luffy's amazing comeback from 15th to the podium in the perilous 3 hour GT enduro. Although we don't like being beaten, we are absolutely thrilled for Jaxon and Tim who took outright victory in the AEC 3-hour race in an Audi R8. And while MR wasn't running the car both Jaxon and Tim are students of the MR Driver Development system so we were very proud to see them on the top of the podium beside their driver coach Luffy and his team-mate Fraser. 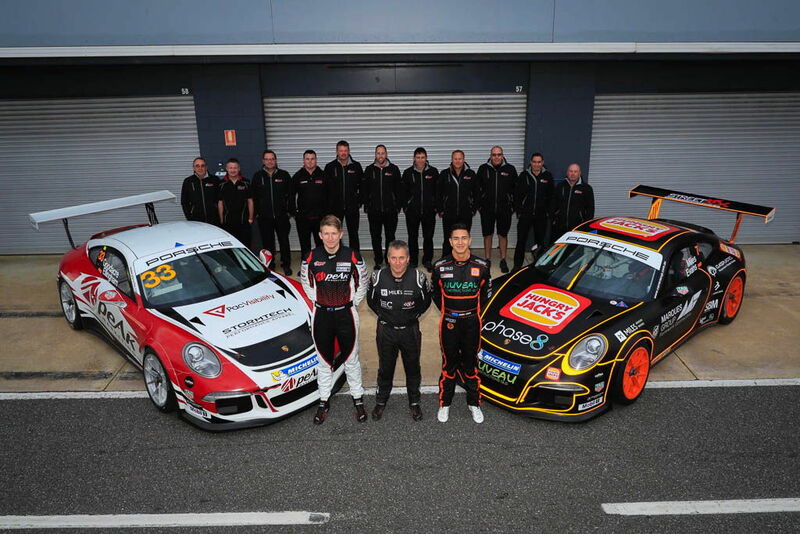 Many thanks to our Carrera Cup co-drivers John Goodacre, Tim Miles, Anthony Gilbertson and Warren Luff, as well as the parents, partners, sponsors and supporters of all of our regular drivers. And finally, many thanks to the #AMRC (Awesome MR Crew) who had their fair share of repairs to do over the weekend but were always in good spirits and acted like true professionals. Thanks guys!! We'll leave you with a great shot of some of our Kiwi born drivers and crew that was taken for an upcoming story in the Porsche Christophorus magazine about Kiwis in top line Australian motorsport. 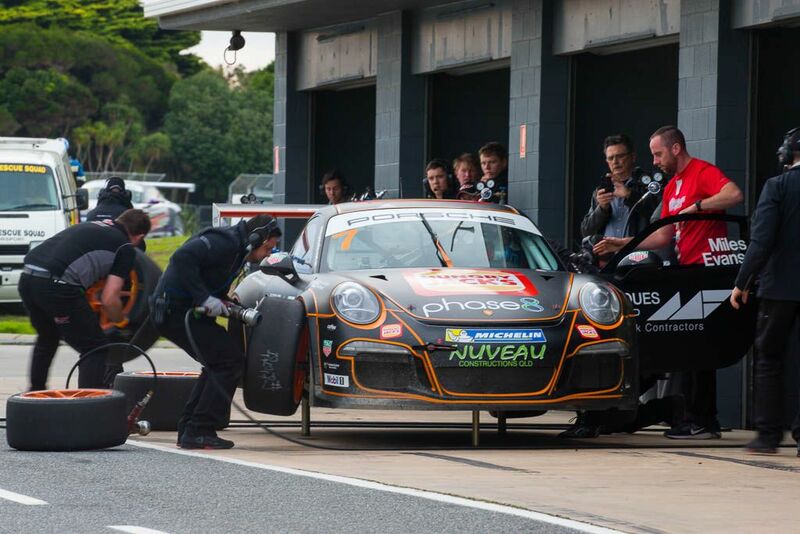 Next round is the Porsche GT3 Cup Challenge at Winton on the weekend of the 10th June and then the Porsche Carrera Cup at Darwin the following weekend so we better get back to work!